New Delhi: Shareholders of Jet AirwaysNSE 0.68 % have approved conversion of loan into shares and other proposals as the crisis-hit carrier seeks to fly out of financial turbulence. During the extraordinary general meeting (EGM) on Thursday, the shareholders also approved alterations to the company’s Articles of Association and Memorandum of Association. According to a filing to the stock exchanges on Friday, Jet Airways said shareholders have approved five proposals that were put up for voting at the EGM. Nearly 98 per cent of shareholders gave their nod for “conversion of loan into shares or convertible instruments or other securities”, a move that assumes significance amid the carrier looking to restructure debt as well as raise fresh funds. Increase in the authorised share capital and consequent alteration to share capital clause of Memorandum of Association has been cleared. Shareholders gave their nod for alterations of the Articles of Association of the Company, ‘Object Clause’ and ‘Liability Clause’ of Memorandum of Association of the company. On Thursday, Jet Airways founder promoter and Chairman Naresh Goyal did not attend the EGM and the meeting was chaired by Whole-Time Director Gaurang Shetty. During the meeting, which had lasted for around 40 minutes, Deputy Chief Executive Officer Amit Agarwal told shareholders that the airline has been talking to various investors for capital infusion. 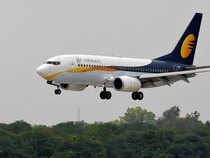 On February 14, Jet Airways’ board approved a Bank-Led Provisional Resolution Plan (BLPRP), whereby lenders would become the largest shareholders in the airline. Shares of Jet Airways rose nearly 1 per cent to close at Rs 236.70 on the BSE.